Congratulations to Allan Prentice, Bill Tindall and all their cast and crew who put on a fabulous panto this year. We had record audiences for this years show, with almost a complete sell out. The panto was well recieved from all quarters and financially proved to be one of our best ever. Well done to one and all, it was a great show. Phoebe Rees - Sadly the inevitable happened and we were unsuccessful at these awards again, despite much critical acclaim from our punters. We were all naturally disappointed, but the show must go on. At least those that attended the evening had a great time and had the pleasure of supporting our near neighbours from Minehead, who won many awards for Dancing at Lughansa, Sweeney Todd and Wilmslow Boy. Never mind we thoroughly enjoyed putting on Run for Your Wife, it's just a pity that the powers that be didn't enjoy watching it! The show runs from 11th to 15th December 2012, at the Roadwater Village Hall, starting at 7.30pm. Tickets are priced at just £6 for adults and £5.50 for U16's and OAP's. There is a £1 reduction for Somerset Fellowship of Drama individual members. Get your tickets early, they will become scarce for the latter nights especially. This years AGM took place on 17th July at the Village Hall. Ben Lintott replaced Allan Prentice at the helm (following Allan's retirement after 7 years in the hotseat! ), Jackie Heard took over the role of Treasurer and Nancy Marshall continues as Secretary. The rest of the committee for this year is, Allan Prentice, Susie David, Chris Marshall, Sarah Kingsford and for her first year on committee, Verity Martindill. Thanks to all those that stood, it was a change to actually have an election. Comiserations to Dave Cox and Nige McBrayne who both stood, but failed to get the required votes. Special thanks to Nige, who has been our treasurer for the last 12 months. During the meeting two presentations were made. Before stepping down, Allan presented Jennifer Hand with an Honourary Life Membership of the Players, recognising her many years of unstinting support for the Players. Congratulations Jenny! Then following his election to the Chair, Ben presented Allan with a certificate of Outstanding Service to the Players, in recognition of all his hard work in recent years. It was reported that this was a very successful year for the Players, with success at both the Cinderella Awards and Phoebe Rees Awards, and with two great shows, Puss in Boots and Run for your Wife. Financially, in round figures, the Players made a £500 profit for the year. Well done to all concerned for another successful year completed. There were one or two minor pieces of business at the end, and the meeting was wrapped up at approximately 8.30pm. Thankyou to all those that attended. This years AGM will be held on Tuesday 17th July 2012 at the Village Hall, beginning at 7.30pm. Please come along and contribute to what is usually a lively affair. Refreshments, both alcoholic and soft, and nibbles will be on hand to lighten the load! We need the membership to contribute to the day to day running of the Players and put forward some ideas. Please note there is a proposal at the AGM that the membership subscription be increased to £6 for adults and £3 for junior members. This motion will be voted upon at the meeting. Would you therefore kindly pay your subscriptions to the new secretary at the end of the meeting rather than the usual process of paying on the way into the meeting. Please check your contact details are correct on the way in and tick the attendance record. If any member wishes to have an item added to the agenda please notify me and Allan Prentice, in writing, at least two weeks (i.e. by 3 July) before the AGM. A reminder that the current committee members will stand down at the meeting and nominations are invited for the election of committee members at the meeting. Many of the current committee are planning to stand again, but if you would like to stand as well please ask a member to nominate you on the forms which went out by email. If you believe there is a candidate you would like to put forward please obtain confirmation the person is willing to stand before nominating them. The annual dinner went well again this year with a very good turnout. The food was the usual good Valiant fare, and it didnt take long for the free wine to be drunk! Ray Eyers gave a short but amusing speech to the guests at the end of the dinner and a good time was had by all. The Clive Cooper Trophy was won by Bill Tindall this year, and it was nice to have a large number of the membership in the frame for the award. The Cinderella Trophy evening was good and bad. We won a few awards and nominations for Puss in Boots, but the food at the event seems to get worse and worse every year (This is only the opinion of Ben Lintott and not the general membership, but we all thought it was not up to scratch for the cost of the night) Anyway, rant over, below are the list of awards we received on the night. This was a night of recognition for the Roadwater Players’ excellent pantomime, Puss in Boots, directed by Sarah Kingsford. We were awarded the Pint Pot trophy, which is the award for the best pantomime on a small village stage. Very well deserved Sarah. Well done to all involved, and also to Gill White who organised a superb bus for the somewhat long trip to Yeovil. Following our successful trial of ticket sales for Panto 2011, we again sold tickets online for our Spring Play, 'Run for your Wife'. We see this as a useful addition to both our sales and our online presence which we are trying to build.Keep checking back for more information; tickets will be available in the autumn for Panto 2012. Things are moving along with this years play, Run for Your Wife. Rehearsals are going very well, set/props/costumes are getting there and tickets are starting to sell. If you haven't got one yet, don't hold back until the last minute, they will get tight over the coming weeks. Please tell friends and relatives about the show and if you have Facebook, there is an event page which you can sign up to. 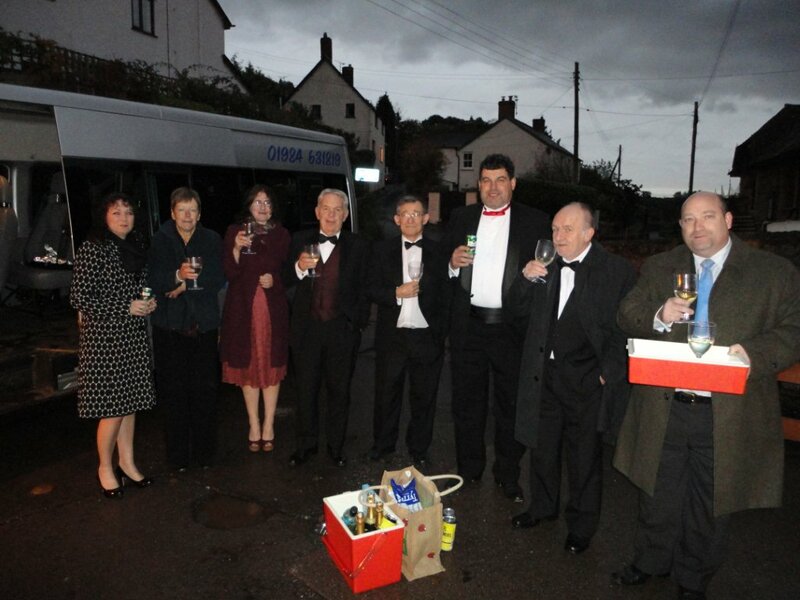 On 19th May we are heading by minibus to the Cinderella Awards at Yeovil. We've got a good group going so a fun night should be had by all. Areport will follow. Reminders; The Annual Dinner, which is on 16th June at the Valiant Soldier; invitations will be coming out shortly, please respond early in order to book your place. Speaker for the event is Ray Eyers (Ayers??) from Minehead, who has acted with Roadwater in the past and as many of you will know is a thoroughly entertaining guy. Should be a good night. The AGM is 17th July at 7.30pm in the Village Hall, information will be coming along shortly. Do make an effort to come along, it is your chance to have your say. Drinks and nibbles will be provided on the night. Anyone considering standing for the committee should think about it now and get the forms in as soon as they come out. 20th May 2012, 'Run for your Wife dress rehearsal, come along if you can't make the production nights. 22nd to 26th May 2012, 7.30pm 'Run for your Wife, bar open at 6.45 and during the interval of 20 minutes. 'Run For Your Wife', this years chosen spring play, to be shown at the village hall from 22nd to 26th May inclusive, is another masterpiece of comedy by Ray Cooney. Directed by Ben Lintott and having a high quality cast backed up by a highly organised back stage crew, this show is sure to be a roaring success. The curtain goes up at 7.30, but there will be a bar available downstairs from 6.45 and in the interval. Run for Your Wife is the story of bigamist taxi driver, John Smith, with two wives, two lives and a very precise schedule for juggling them both. With one wife at home in Streatham and another in Wimbledon, it all goes wrong for him when he is mugged and both of his addresses surface in hospital, leading to investigations by both the Wimbledon and Streatham police. Having upset his schedule, Smith becomes hopelessly entangled in a web of deceit, aided by his layabout neighbour, as he tries to satisfy enquiries from not only the police but his doting wives! Be prepared to split your sides and roll in the aisles. Tickets for this show are now available, both from our usual outlets, and from our online sales page (See left hand sidebar). Please see the next up page for more info and rehearsal information. This years skittles night took place on 16th March and was organised by Chris Marshall. Unfortunately for all comers, last years Champion, Ben Lintott, was again triumphant in the game of killer. Thanks to Mike and the Valiant crew for the top spread they laid on for us, and to Chris for organising. We did have a superb turnout! The Players Annual dinner is set for 16th June at the Valiant Soldier. Our guest speaker for the evening is well known local actor Ray Ayers. Organised by Nige MacBrayne be sure to get your place booked early. Menu options will be available soon, and Nige will be incontact then. This event took place on 28th December at Minehead Golf Course. A total of 5 members turned up and played some creative golf in some challenging conditions. Congratulations to Nancy Marshall who came out on top, with Allan Prentice second and Ben Lintott third. More members are needed for the next outing which is scheduled to take place after the Spring play in May! On Saturday 22nd October a select group of representatives of the Roadwater Players attended the Phoebe Rees awards dinner. And what an evening it was! the trophy for the 'Champagne Moment'.This is the 'wow' moment, out of all the entries, for an unexpected and wonderful moment in a play. Titfield was awarded the trophy for involving the whole audience in passing forward the water, in a variety of vessels, through the Hall in order to fill the water tank and save the day. the award to the play with the best effects - well done Patrick and Dave Walder. It seems quite appropriate that, following major works in the Hall and our not inconsiderable expenditure on lighting etc, we win an award for light/sound /effects. Well done to all concerned. Please see the page 'Next Up' on the tab to the left of the page, to get details of our upcoming show, which is Puss in Boots directed by Sarah Kingsford. Here you will find details about performance dates, auditions and a rehearsal schedule. Alternatively you can click here to be taken to the relevant page! Following much deliberation, the committee have taken up Ben Lintott's offer to direct a play next spring. Ben wants to direct a comedy/farce, and although several scripts have been read, he still hasnt finalised his choice of play, but will be doing so in the next couple of weeks. As soon as the decision is made we will get the title up here for all to see. Auditions for this play will take placeon Thursday 12th January 2012, for rehearsals to start on 2nd February. The actual production dates are 22nd to 26th May 2012, but these dates are yet to be confirmed. Anyone interested or wanting to help can contact Ben on 01984 640276. This years Fellowship AGM was held in our Village Hall. Organiser for the event was our local Rep Chris de Vere Hunt, who asked us to provide some 'entertainment' for after the AGm and the buffet. Various things were organised, ranging from monologues, to songs, to sketches and lastly a short reading. All were well performed by Chris and members of the Players, and we put on a great show that was well received by those present. Thanks must go to all performaers and helpers on the night - we have done our reputation in the drama community no harm at all by doing this. Well done everyone. This years AGM went off well. There was nothing major to report, other than the news that Bill Tindall and Brenda Mandziej stood down from the committee. They were both thanked by Allan for all their hard work and dedication, and were given long service certificates to mark the occasion. They will be sorely missed. Our finances are looking pretty healthy, with very good profits made in the Panto, and very pleasingly in the play also. These higher profits will help to pay for the new lighting system we installed in the Hall at the time of the Village Hall revamp. On a sad note, it was brought to the members attention that Josie Cox had passed away following her long battle with illness. Many members had attended her funeral the day previous to the AGM, and we were all pleased to see Dave at the AGM despite his personal grief. Best wishes to Dave, I'm sure everyone in the Players will be there for him in the coming months as he comes to terms with his loss. We had a great turnout at this years AGM, which can only be a good thing for the Players. In the coming months we are endeavouring to set up online ticket sales and subs, so do keep an eye out for that. Sarah needs volunteers to help clear out the Barn on 20 and 21 August. A couple of hours of your time on either day is all we need, please try and help - give Sarah a ring on 01984 640773 to arrange it.